In Japanese home cooking, Abura-age (fried beancurd ) is a very popular ingredient. It’s basically a deep fried sliced tofu and available at any Asian grocery stores these days (at least in Seattle area). Typical recipes using abura-age include miso soup, rice dishes and Inarizushi (sushi stuffed sweeten abura age), but you can easily substitute meat products with abura age because of its rich and satisfying flavor and texture. 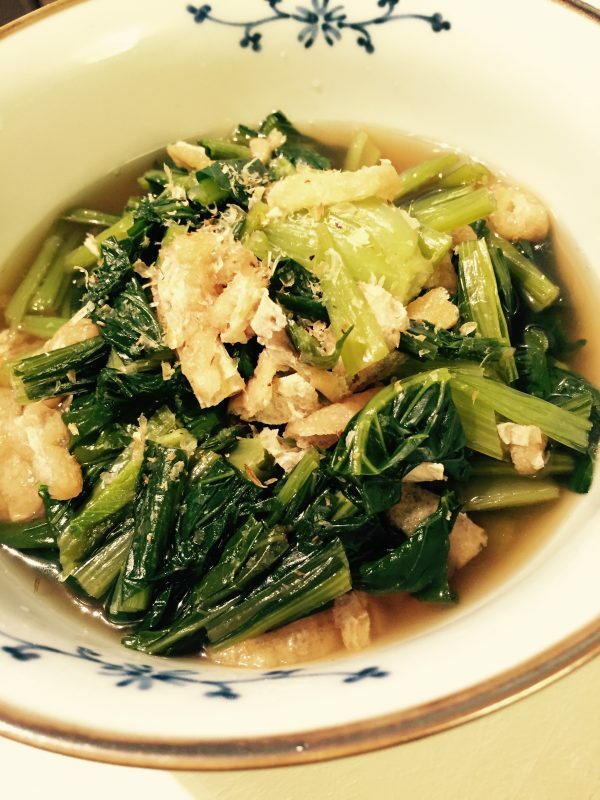 A quick and easy recipe to enjoy fresh komatsuna or other leafy greens. It's a good idea to have dashi stock available in the fridge. Put water and kombu in a medium sauce pan, and heat it over medium-high heat. Once the water starts bubbling, add bonito flakes. Do not boil. Turn off the heat in 30 seconds and let the dashi sit for 5 minutes until the bonito flakes start sinking to the bottom of the pan. Using a cheese cloth, sarashi (Japanese cotton cloth), or paper towel, strain dashi slowly. Save the strained kombu and bonito for reuse (and making the second round of dashi making). Cut komatsuna into 2 inches long. Note: If you use spinach, you should blanch it in boiling water for 30 seconds, strain it and squeeze excess water). Pour hot water on both sides of aburaage to rinse off excess oil. Slice aburaage thinly (5 mm wide, 1 inch long). Put katsuo dashi, sake, and mirin in a sauce pan and heat over high heat. Once boiling, add soy sauce and turn down the heat to medium-low. Add in the cut komatsuna and aburaage. Cook for a minute. Turn off the heat. Leave the pan for 30 minutes to let the ingredients absorbe all the great dashi flavor. You can serve warm or store it in the fridge and eat cold.